12DaysOfNickJr.com: Instantly Win Today's Prize! 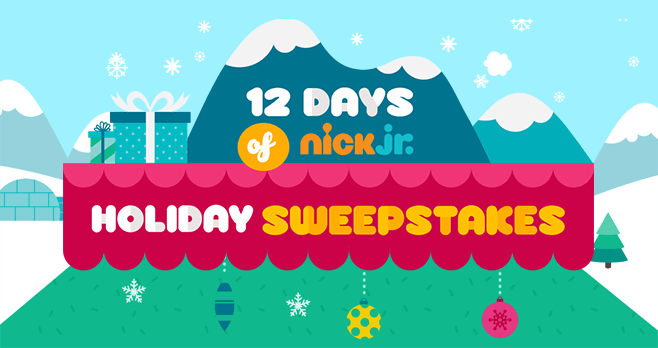 The 12 Days of Nick Jr Holiday Sweepstakes is on. Join the Nick Jr. Fan Club and enter daily at 12DaysOfNickJr.com for your chance to instantly win today’s prize. Every day through December 9, Nick Jr. is giving away amazing prizes including PAW Patrol toys, Shimmer and Shine toys, Peppa Pig Family toys and other fantastic prizes. The 12 Days of Nick Jr Holiday Sweepstakes is open to legal residents of the 48 contiguous US and DC, 18 years of age or older at the time of entry who are a member of the Nick Jr. Fan Club. The Sweepstakes begins at 12:00:01 a.m. ET on 11/28/18 and ends at 11:59:59 p.m. ET on 12/9/18. Limit of one entry per person per day. The grand prize consists of a trip for 4 to Nickelodeon Hotels & Resorts Punta Cana. Visit 12daysofnickjr.com to enter and see Official Rules for details. I know 3 little boys who would really enjoy these gifts. Help me surprise them.